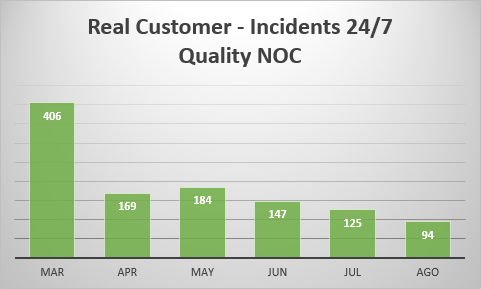 This chart shows real customer data, the first month we handle all usual incidents. Then started working proactively to reduce the number of incidents, improve the quality on detection of critical alarms, also working with thresholds and reducing downtime. Clearly you can see how we reduced to 1/3 the amount of incidents. 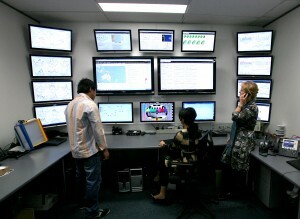 We continue working the next months adding more services checks and gathering information to create reports. We do a continue improvement of service checks, maintenance and proactive work to avoid incidents and increase up-time. After 6 month we probably manage to reduce to 1/4 the amount of monthly incidents and increase dramatically the up-time. We are all very happy, our customers and us. We enjoy working with our customers.